Yesterday we took my son Thomas back to school; his second sophomore semester begins tomorrow at Boston University. Here's how things were supposed to go: He and Cathy and I were going to get up early, go to 6:45 mass (a quick one, sans music), go back to the house to say good-bye to Nora, hit the road and get diesel and breakfast in NJ (we were low on fuel), and be in Boston by noon (and getting some good chowder for lunch on such a cold day) while Nora took the Saab to 9:00 mass, and spent the day studying for her finals this week. Not what happened. We were fine, right up to the getting diesel in NJ part, which we did in Ewing, just over the river. As we were finishing up, Nora called -- Thomas forgot his new computer! Okay, we'll go back, it's only 15 minutes, and since she's now fully awake, we'll all have breakfast at the Langhorne Cafe. But she still wants to go to 9:00 mass, so she says, I'll drive the Saab down and meet you at the diner, and we can all leave from there. Okay...but as we're pulling into the parking lot, she calls: Saab won't start! Up the hill to the house, a mile away, and sure enough, battery's dead (it was quite cold, about 15 degrees F). Get the jumpers out of the Jetta, fire it up, race around the neighborhood, turn it off, and...starts right up. Just cold? Dunno, but we decide to go back to the diner with both cars. We get to the diner -- it's full. Okay, we go to another diner, the Blue Fountain down on the Lincoln Highway. I took the Saab, revving it high and stoking more amps into the battery. We get into the diner, sit right down, and that's when Cathy and Thomas tell me that he had not just forgotten his computer...he'd forgotten his dorm room keys as well. But he has them now -- thanks to Nora! -- and all's well, and we have a big laugh, and a great last breakfast together before taking Thomas back to school. The Saab starts, we drive back to the house, leave Nora with lots of hugs (and pets to the Corgis, who are now thoroughly confused), and get back on the way to Boston...over two hours later than planned. It is, however, a beautiful day, and traffic's quite light, and we make it there in only 4.5 hours, traveling largely at or near the speed limit. I actually got some editing done while Cathy drove in Connecticut. By the time we got there, though, we were getting a bit peckish. We first thought about going to Legal Sea Food for chowder -- I've never been, and it's a place you should probably go at some time -- but decided it was out of the way, and Thomas recalled The Daily Catch, a little Sicilian seafood place in Brookline that he and I had chanced upon last year (we were on our way to Soul Fire for a barbeque dinner when we realized it was Friday in Lent...and there was The Daily Catch right across the street from our epiphany, so we went in and greatly enjoyed it), so we went there. Had the place to ourselves, and you're probably wondering by now what any of this has to do with beer or whiskey or anything else you might be interested in -- to which I think I can properly reply that it's my blog, and I can write about whatever, no? -- but here's your payoff: Cathy and I ordered beers from their local-heavy selection. She got a Cape Anne IPA, which had a solid malt character I found appealing, and I got a Berkshire Steel Rail Extra Pale, a beer I've always enjoyed since my first tasting, years ago. 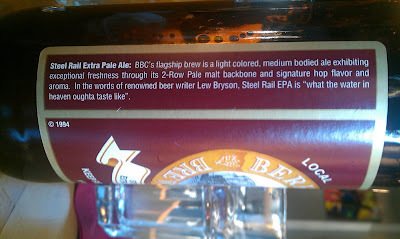 And I was reading the label, curious if they had an ABV listed (5.3%, it turns out), when I came across the text shown in the picture: "In the words of renowned beer writer Lew Bryson, Steel Rail EPA is 'what the water in heaven oughta taste like.'" Ha! I was surprised to find this, the first time I had any inkling that Berkshire had quoted my Ale Street News column from 2009 on the lack of respect pale ale gets from the geekerie. It's fun to see your name on a label; hell of a lot more fun than on a wanted poster, I assume! Anyway, the meal was excellent: we had the house specialty fried calamari to start (made fresh there, not frozen), and I had calamari with a seafood-based red sauce over linguini, Cathy and Thomas each had scallops and linguini with white clam sauce. Quite tasty, and quite good with the beer. We took him to the dorm, unloaded, sat with him a bit, and got him settled in, saw his roommate again (real nice guy, spent Christmas with us), and...headed home. Even less traffic, another quick run...and the Saab won't start. Time for a new battery. Cheers! The Daily Catch is hidden gem in Boston, I prefer the one in the North End myself.